Jubilations released ten days ago. Preorders opened six and a half weeks ago. i started binding in advance—hardcovers, especially when the paper has to be hand-cut, take awhile—but i hit a production hitch right after release and everything ground to a halt. Now, instead of having everything shipped by the end of last week, i’m back to the drawing board, trying to figure out why my bindings are so tight and how i can recover all the work i’ve already done and fill the orders that are still waiting (almost half of them!). For a week or so i’ve been going to bed and waking up worried. People need their books. And it’s finals week—i’ve got homework hanging over me, too. But the good news is i think i’ve finally hit on what’s going wrong. i hand-stitch all my books, hardcover and paperback, rather than relying on glue alone, but i learned early on that you can’t skip gluing them also. 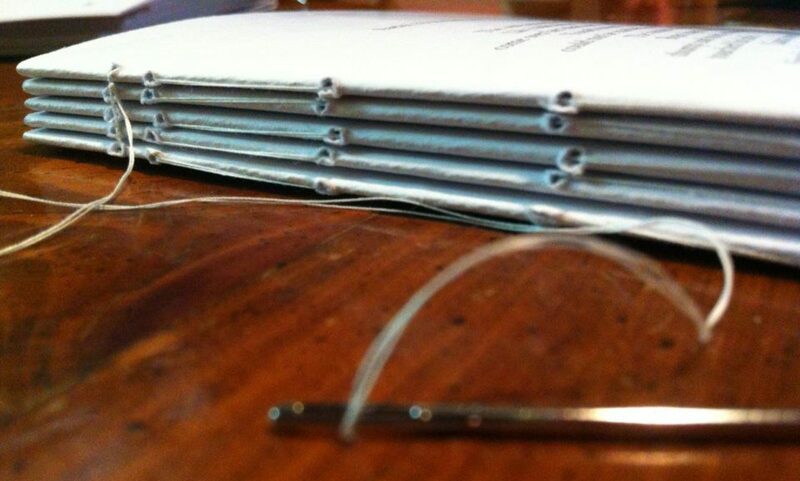 Sewing is what keeps the pages from coming out, and gluing is what keeps the signatures tight. So after they’re sewn, they’re clamped together and i apply glue over that stitched side and squish it into the gap between the signatures. Well. This works really well to insure that there are no gaps between signatures, but when i lay the text block down on the table and open the first page, the little line of glue that invariably ends up along that bound edge keeps the page from lying flat. Instead it has a curve to it. It’s a little pleasing curve, nice to look at. And that curve pulls on the book boards. The solution to this seems to be that instead of positioning the back of the text block so that it’s aligned with the back edge of the cover board, i need to scoot it back a bit into the hollow spine so that the natural curve of the first page doesn’t pull. i’m reinforcing the spine as i go also, just for a bit of added stability. But i’m pretty sure that this slight repositioning means i can finally get back to binding and shipping. Meanwhile, what happens to those copies that didn’t go together right? They took a lot of time to make. The cotton rag i’m using isn’t cheap. And the poetry is still exquisite. It’d be a waste to discard them. So i’m taking a page from Thaddeus Glapp, fixing the bindings, and then offering them on a discount as Hideously Gnawed. Fixing them means cutting them apart, so Hideously Gnawed copies may have doubled endpapers where i sliced out the text block and pasted it back in, or if i had to cut the cover i’ll reassemble it with an extra strip of watercolor paper wrapped around the spine. They might have needed some hinge repair, in which case an extra strip of text paper will be pasted in. 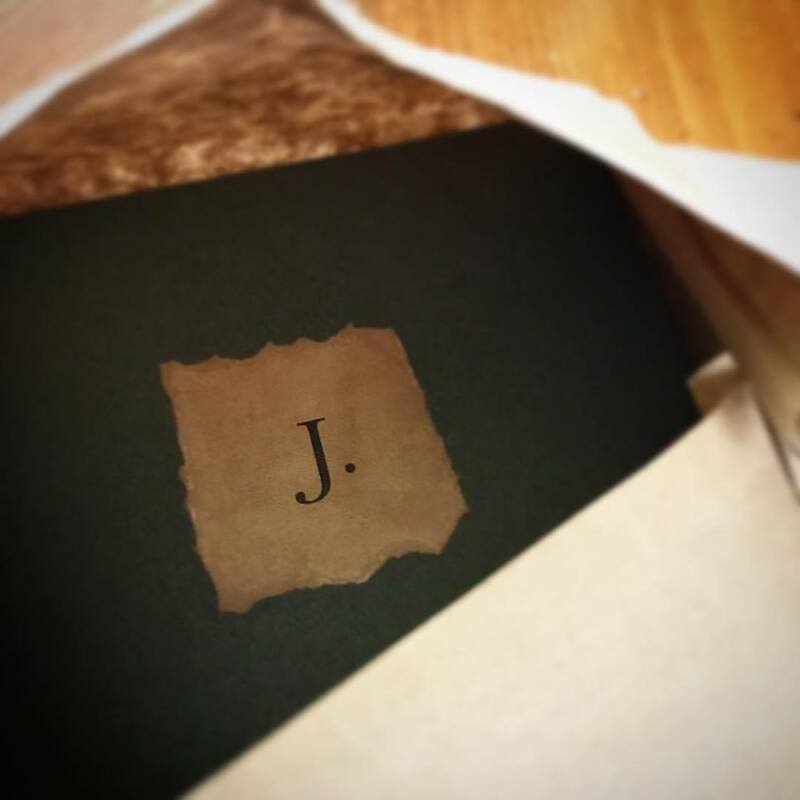 They’ll still be perfectly readable and they’ll still have their little hand-torn, walnut-inked J on the front. But you’ll be able to pick up a Hideously Gnawed hardcover for what is essentially cost—materials plus the author’s cut plus about a dollar. i might, as we go along, add Hideously Gnawed paperbacks, too, if a copy’s cover paper wrinkles (as is its wont; i must watch it and weight it carefully). Here’s a view into the last month’s work, and a poem to tease you into purchasing, and a link to Goodreads (which is how you really know it’s official!). Two years ago during Lent i discovered a poem cycle that has carved itself into my bones. It appeared in the Rabbit Room’s first installation of their annual literary journal, the Molehill. i had been reading along, a piece here and a piece there—fiction, essay, recipe, poetry—and when i came to this particular work i could read no further. 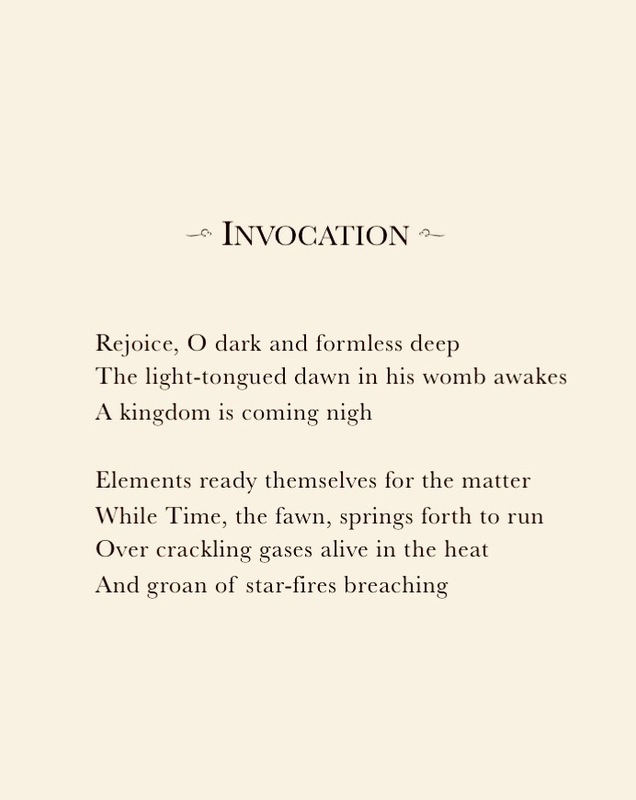 It was called “In the Year of Jubilation,” and was comprised of an introduction and fourteen poems. Somewhere in the reading of these poems i started crying. i had no idea why. The next night i picked up the Molehill again, intending to read the next piece, but i couldn’t. i reread the Jubilations, and again i wept through them. i read those poems every night for a week. Every night the tears started at a different place, but they always started. Over the last two and a half years they have broken and healed me countless times. They inform my prayers. And i still cannot express what they mean to me or why i am crying. This year at Hutchmoot i brought (and within a half-hour had sold) a little stack of paperback Budge-Nuzzards. i have been selling these for a couple of years now, at first by accident and now on purpose. But nustled within my sidebag i also packed a little handbound hardback of the Jubilations for the Mootmaster and Jubilations-poet, Pete. (Is it any wonder that he is my Patronus?) He marveled over it, called his wife over to see it, and then asked the question i had been hopefully and nervously wondering if he would ask: “Are you going to bind and sell these?” i fumbled through turning the question back to him. They’re his. The Budge-Nuzzard is freely available online, but the Jubilations are out of print. i wouldn’t think to sell them without his consent—but the world needs these poems. i need them. i will be needing them for a long, long while yet. And he gave me permission. These perfect little flickers, these candle-flames, will not be lost. i am so grateful. Henry and the Chalk Dragon, by Jennifer Trafton (Rabbit Room Press, 2017). i am not an impartial reviewer of this book. i’ve been agonizing over this, because i want to write a review worthy of the book itself, but the truth is that i adore Jennifer Trafton. She makes me want to be brave, and sometimes, with her whispered kindnesses in my heart, i can be. Be brave. Be brave. Be brave, says Henry’s chivalry. It’s hard for him to be brave, too. He is a knight, but he is also an Artist, you see, and his wild imagination is hard to contain, and just as hard to let out. When he tries to draw nice brown bunnies calmly eating lettuce, the Work of Art inside him aches to draw bunnies that jump so high they tear holes in the clouds and land on Mars, or a rocket-powered bunny with laser eyes. His teacher and principal don’t know what to do with him. He has one best friend, but is afraid the other kids won’t understand—even his best friend doesn’t always. So when one day he draws a magnificent jungle-green dragon on the back of his blackboard-painted door and it runs away, Henry is more worried than anything, even though his dragon thrills him. Suddenly, the Work of Art he has been hiding is out in the world for everyone to see. i don’t know what i love best about this book—the chivalry, which is often funny (“Don’t feed girls to dragons”) and often cuts right to my own fears as an Artist; the golden trumpets of Jade’s bardic songs; the way Henry’s conflict with his best friend, and his dragon, and his Art, and his principal, all collide and swirl toward and past and around each other to resolve into beauty (the one moment with his dragon—oh! i might cry right now); Oscar and his pet octagon; their wonderful teacher Miss Pimpernel with her beaver-teeth hair (she was a superhero, you know)… i could go on for days. My copy of this book has already been colored in. i couldn’t help it. After reading Henry, the colors won’t hold still. i am going to stop writing and go back to coloring—and then later today, i am going to go back to my own writing. Because when i am tempted to think i can’t, Henry’s chivalry tells me Tie your shoelaces. Illustration by Benjamin Schipper. 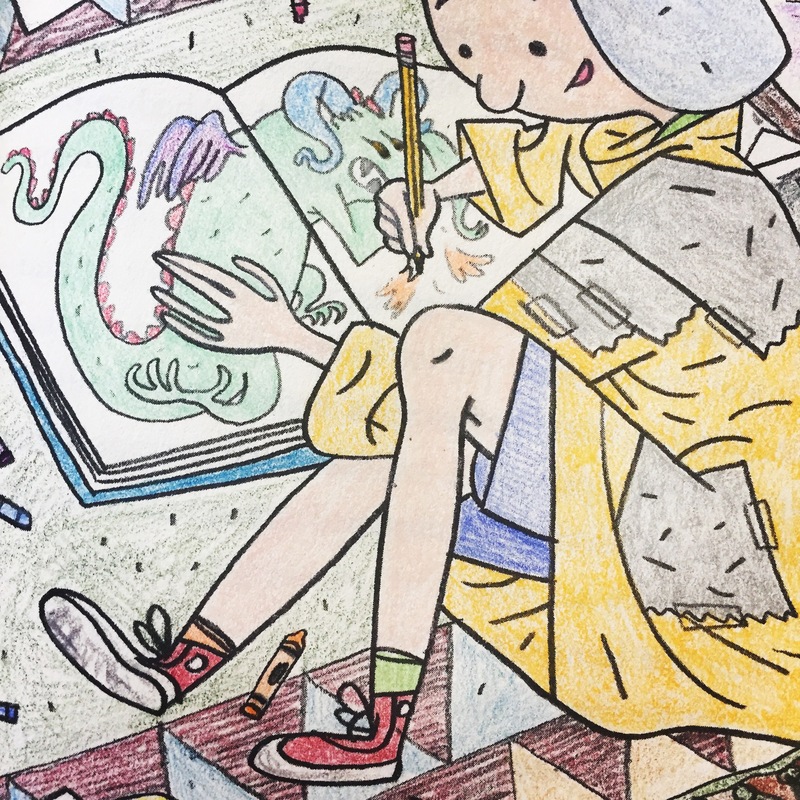 Coloring by me and Henry. Henry and the Chalk Dragon releases April 4. You can preorder at the Rabbit Room—preorders come signed, and with two free coloring pages (but i do definitely recommend coloring in your book!). Jennifer is also the author of The Rise and Fall of Mount Majestic. At last count i had bought twenty copies of this book so far. i love it with my whole heart. You should read that one, too. This spring semester i had the hilarious and deeply satisfying experience of writing heresy—Budge-Nuzzard fanfic in biblical Hebrew—for seminary credit. It was an immensely engaging and creative endeavor, and i took no end of pleasure in offhandedly mentioning “my heresy” in my advanced Hebrew exegesis class and citing Thaddeus Glapp in the biography of my capstone paper. It’s crazy to think that i was permitted to get away with this nonsense. Classical Hebrew spec-fic? Inventing words in a dead language? Graduate-level Budge-Nuzzard scholarship? Weench midrash? Gosh. i am the luckiest nerd alive. The Yaunsi Heresy is a new work of fiction in classical Hebrew based on A.S. Peterson’s lobidious tale of the Budge-Nuzzard. It will be published in serial. Click “Yaunsi Heresy” above to read from the beginning. When Yaunsi had come to the city of the man, he sat at a well, for he was thirsty. He lifted up his eyes and saw at the well a woman, and behold, she was beautiful of form and beautiful of appearance. Yaunsi dwelt in his mercantile for one week of days, but the Man did not go out from his house. Yaunsi hung around three days, then he hung around two days, then he hung around one day more, and then he could hang around no longer. He set out. He laughed when he had gone out. Then he said, “It is done! Foolish Weem! Foolish to contend with such a Pan as i!” Then he went to his mercantile and waited to see what would happen. Yaunsi removed his teeth from the Man from Vim-Ti. He removed his head-covering, and under it was a square of linen. He let slip the foot from his mouth and dried it. Then Yaunsi said to the man, “Verily!” and in a cloud of darkness he vanished and departed.